In the early spring, there are caterpillars that can completely defoliate Live Oaks and other trees. These worms feed on the lush new growth that is produced by the trees in early spring and will often eat all of the newly developed leaves. The common name for these worms are Oak Leaf Rollers, or Loopers. (Lepidoptera: Tortricidae) These insect occur throughout Texas, but are most destructive in the Texas Hill Country and especially Temple, Belton and Harker Heights. These worms spin Silken threads from which they hang when dislodged from the leaves, and branches, when dislodged or disturbed. Walking through these dangling caterpillars can be a nuisance, in fact many people avoid going outside, during high infestation months of April and early May. When a tree is defoliated during the growing season, it becomes stressed and occasionally serious damage can occur. Green leaves manufacture sugar that is later converted to carbohydrates and are essential for a tree to grow and live. When a tree is defoliated, it stops producing sugar and, which slows tree growth. Although deciduous trees (broad leafed trees that loose their leaves in the winter) can survive for short periods of time without foliage, this process uses up valuable stored energy, that a tree would need for its natural defense mechanisms. Importantly, these stressed trees are more susceptible to attack by various diseases and insects. Weakened trees are extremely susceptible to wood-boring insects such as longhorn beetles, flat-headed tree borers, shot-hole borers and many clear-winged tree borers. If the trees are completely defoliated year after year, especially under the drought conditions that are common across Texas, they will die. The adult moth of the Oak Leaf Roller, is about 1/2 inch long, Its wings are brown mottled with dark brown markings. This species undergo one generation per year. In May the moths lay their eggs on twig tips and leaf buds of several tree species, most notably, The Texas Live Oak. The eggs remain on the twigs and buds for about ten months and begin to hatch in mid March. Once they hatch, the caterpillars or larvae, feed on tender new Spring growth of the trees from Mid-March until late April. The larvae are creamy white to greenish and have a dark black or brown head. Trees that are heavily infested will be defoliated by mid to late April, when the fully grown worms form the pupae stage on the tips of twigs, and on other adjacent plants. 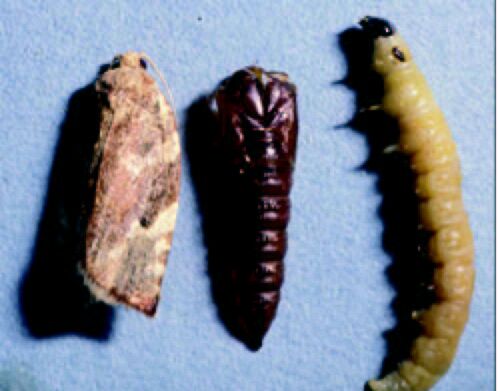 At about the first of May, moths begin to emerge from the pupa stage (cocoon) and begin laying eggs on the twigs of Live Oaks, Hackberry, Pecan and Walnut trees. These eggs will remain dormant until the following march, thus completing the cycle. In residential situations trees may need protection from caterpillar outbreaks. Valuable landscape trees with a history of leaf roller infestation should be watched carefully from Late March to mid April. If heavy leaf feeding damage is observed, the tree should be sprayed with either a carbaryl product, or an insecticide containing Bacillus thuringiensis var. kurstaki. To minimize stress and to restore tree vigor, Oaks or other trees that have been severely defoliated in the past should be fed with a balanced fertilizer and watered regularly. Choose a fertilizer that has equal parts of the three major elements and apply it at a rate of one pound of nitrogen (N) per diameter inch at waist height. This pesticide application is best left to a professional. * Please note: The Texas Two Step program does not require the spraying of any product into the air.